Team Leader and Founder of TMC. David’s vast experience and creative input plays a key role in our campaigns as he oversees the whole account team. 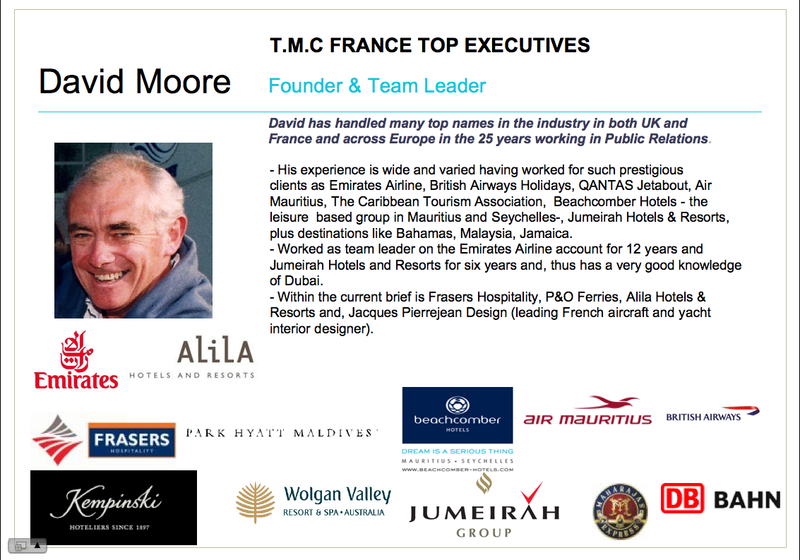 David was recently in charge with setting up PR strategic campaigns for Park Hyatt Maldives Hadahaa, BeachcomberHotels (Mauritius, Seychelles) and is supervising AlilaHotels & Resorts new openings campaign. Experienced in media training and communications strategy for prestigious accounts, David has been part of the PR industry across the United Kingdom, France and internationnally for about 25 years. Account Director and co-founder. Sandrine’s media contacts and writing skills as a previous tourism and lifestyle journalist are invaluable to our team. 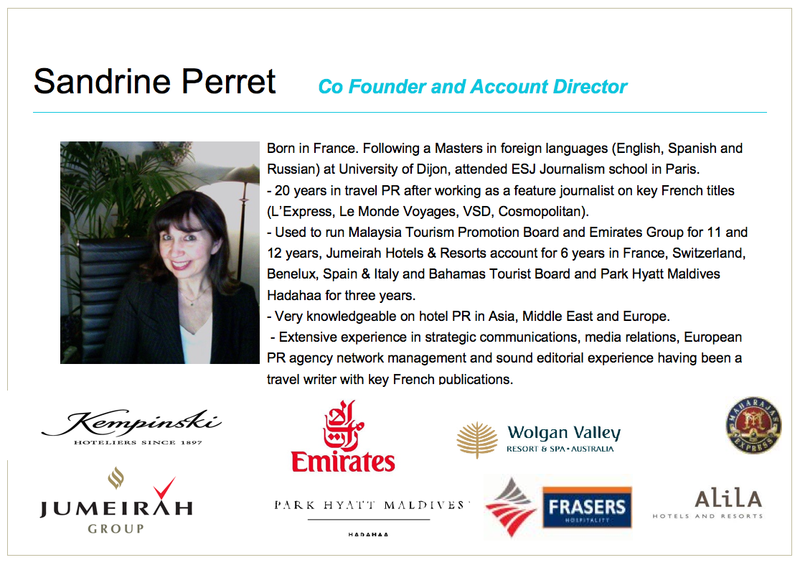 Sandrine was managing Emirates Airline daily PR activities, including major events (routes launch, major media briefings with key management, all the different stages of Emirates A380 launch in Toulouse and, then Paris). She was also handling for 6 years Jumeirah Hotels & Resorts account (Jumeirah Talise Spa, Festival of Taste, Wild Wadi…) in France, Benelux, Switzerland, Spain and Italy togetherwith David and an account team member. Sandrine is now in charge with Alila Hotels & Resorts PR and promoting theiroutstanding design and architecture, as well as raising the profile of Spa Alila and the Shop Alila brand, securing consumer brand partnerships. Community Manager and Head of Food. Born in Paris and bilingual in both French and English (fluent in Spanish too), Charlotte holds an International Relations Bachelor and Communication Masters and has experience as a journalist as well as a food blogger. Since Charlotte has joined TMC, she is in charge of developing and feeding news to online media and also runs all the social media aspects of our campaigns together with Sandrine. 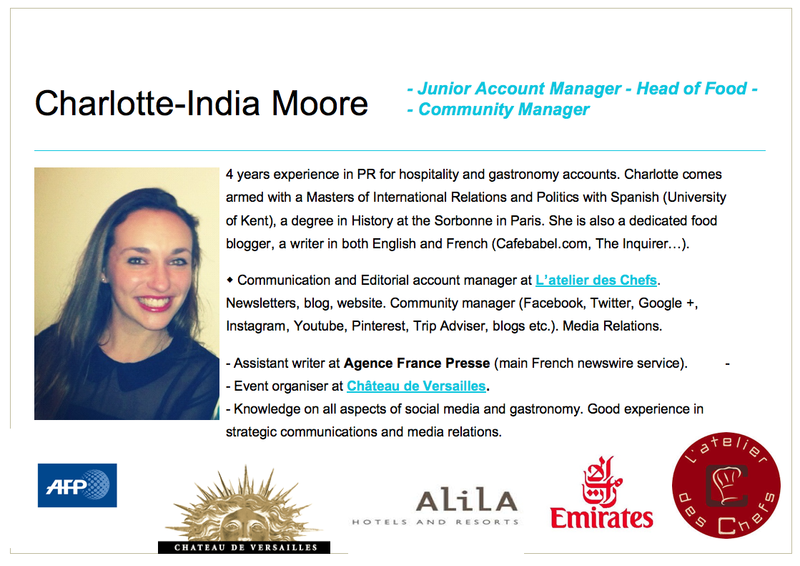 Charlotte-India is also T.M.C’s passionate Head of Food, having worked for « L’ateliers des Chefs » and running her own popular culinary blog with key partnerships. Charlotte therefore works together with online influencers, brands and journalists and dedicates herself to the online communication strategy for all of TMC’s clients.